Enthusiasts of Italy travel often say that if you haven't been to the Amalfi Coast, you haven't seen Italy in all its glory. This colorful southern Italian gem certainly deserves a visit, and in this article, we share information about the most incredible Amalfi Coast destinations which are worth putting down on your agenda as well as answer many often asked questions about the region and even compare Cinque Terre vs Amalfi. Ready? Set high among cliffs on the banks of the Tyrrhenian Sea, there are about a dozen balcony-like multi-colored towns of the Amalfi Coast. It's more than fair to say that each place of the UNESCO-listed region boasts outstanding views and something special of their own, so below are some of the highlight locations which should be seen when on Amalfi Coast tours. Among the most visited places is indeed Sorrento. Interestingly, territorially it isn't directly a part of the coast but is somewhat a doorway to it. This city is rather large compared to the others and is most famous for its citrus groves, and, in its turn, for producing high-quality limoncello, the iconic traditional Italian beverage. 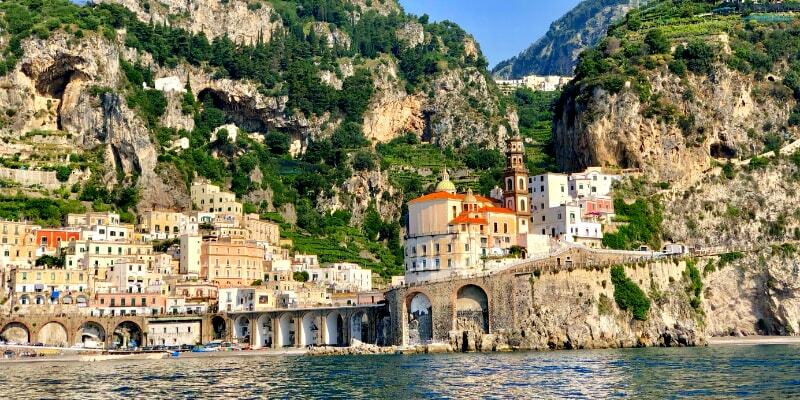 Next up is a town with an interesting heritage, the city of Amalfi. It is best recognized by its 9th-century Duomo cathedral. Home to many maze-like cobblestone streets and sun-kissed piazza squares, it is one of the most favored Amalfi Coast points. Alurring Ravello is for sure among the prettiest spots on the coast as well. This romantic town is set very high up in the hills and offers jaw-dropping panoramas both of the bay and the surroundings. Also, it's often regarded as one of the most elegant and peaceful places on Amalfi. Perhaps the most famous of all Amalfi Coast destinations is the chic resort town Positano. The former large port is best known for its great beach, steep stairway streets, luxurious accommodation, and fancy restaurants. Those seeking a less touristy yet no less fascinating place to travel to should head to Atrani, this adorable town, surrounded by a bending arched foundation, is often depicted on postcards. Other petite sites with authentic Amalfi Coast life which are "off-the-beaten-path" are Maiori, Vietri sul Mare, Praiano, Minori, and Cetara. As you might have guessed, the most often selected places to stay on the Amalfi Coast are the larger cities which have a broader selection of hotels and other infrastructure. These are first and foremostly Sorrento and Amalfi City. Positano is the third popular destination but is generally the most expensive one. Nonetheless, if you're craving a more unique experience, you may always set out to less touristy locations and small villages mentioned above. Note, though, that in this case, it might be hard to find a place to stay as they aren't aimed at receiving hundreds of foreign guests. For this reason, try to take care of the matter in advance, keeping in mind the possible low availability. What is the best time to travel to the Amalfi Coast? Contrary to common belief, the summer months (especially August) are not the best ones for an Amalfi trip for several simple reasons. Reason one: the outside temperatures will be very high (around 33°C / 92°F), making it more difficult to go sightseeing during the day time. Reason two: the summer months are the most touristy ones, meaning crowds, queues, jammed roads, overcrowded beaches and cafes, full hotels, higher prices. Thus, the recommended travel months for a peaceful Amalfi Coast getaway are April to early June as well as September to early November. Ordinarily, these months have a mild climate with soothing thermometer marks, little rain, and fewer travelers. How far is the Amalfi Coast from Rome? As a rule, most people who want plan Southern Italy travel to this region arrive in Naples or, even more often, to the large international Leonardo da Vinci Fiumicino Airport in the Italian capital. In case you're wondering how far is Rome from the Amalfi Coast, the answer is about 264 km (164 miles). Among the possible ways how to get from Rome to Amalfi Coast are by car, train, bus, plane or a mix of several of them. The fastest and best of the options noted above is taking a 1 and a half hour Rome - Salerno train and from there, making your way to your final Amalfi destination by taxi or bus. Generally, this ride along the coast will take you from 40 minutes to 1.5 hours, depending on where exactly you need to arrive. Which interesting places to visit on the Amalfi Coast? In case you want to diversify your time exploring the towns of the coast, luckily there are numerous options. For instance, consider paying a visit to the Emerald Cave. Called Grotta dello Smeraldo in Italian, it is a one-of-a-kind grotto with beautiful blue water, stalagmites, and stalactites. Actually, many tours to this attraction offer a boat ride right in the cave, sounds nice, right? One more site which deserves your attention is the Ferriere Valley, particularly if you're into nature walks. This natural reserve is great for hiking and outdoor recreation, attracting travelers with its waterfalls and nice paths. Plus, you can plan a day trip to the ancient city of Pompeii (located not too far away) which was destroyed centuries ago as a result of the eruption of Mount Vesuvius. Today you can see the excavated archaeological site of the once huge town. Cinque Terre or Amalfi Coast? When you look at images of the 5 villages of Cinque Terre (Monterosso, Vernazza, Corniglia, Manarola, and Riomaggiore) and then on those of Amalfi, it's very difficult to decide which of these places you should visit first. Of course, provided the opportunity, you surely won't regret spending time in both of the destinations, making your way from Amalfi to Cinque Terre or vice versa, as they are equally charming, breathtaking, and filled with history and authentic Italian vibe. But when it comes to making up your mind between the two and weighing Amalfi Coast vs Cinque Terre, it basically goes down to which part of Italy you're planning to visit. If you're heading towards the north of the country, say, to Venice, Verona, Milan, Genoa, the Tuscany region, and, of course, Florence, then the Cinque Terre towns should be a great choice. On condition that such cities as Rome, Naples, Bari or even any of the cities in Sicily are on your travel radar, then, undoubtedly, the Amalfi Coast should be your top choice. All in all, whether you want to spend your entire Italy vacation on the Amalfi Coast or plan to combine it with other regions, this part of the country is a real bucket-list point! To find out more about possible itineraries, feel free to contact our travel specialists who will be happy to answer your questions.